Being a professional contractor who specializes in locksmith services and door repair services and products, allows me to offer unique and specialized products and services to a varied range of clients. We have been continued members of the Home Advisor network, coming on 12 years, ever since it's early inception as Service Magic. The parent company of Home Advisor, ANGI Repair Services, recently completed their acquisition of Angie's List and have melded the Angie's List network into the Home Advisor network to create the largest lead generation service online. One of the not so common requests we receive is "Repair Pocket Doors". It has become an interesting and increasing number of inquiries from customers who suffer from pocket doors that drop wheels or tracks not holding sufficiently longer and doors not straight. There are obviously far too few tradespeople in my region, capable enough to repair pocket doors. Below, find some images we took on a recent pocket door repair. The customer could not find anyone to perform the repair (before me) with almost all contractors they contacted, refusing to repair stuff preferring to only tear out and replace. Doing such, would add significant cost to projects and take much longer than just a repair. In the images above, we display the methods we use to create as little mess as possible and performing the dismantle without the need to cut into the wall, we always survey and estimate all repair jobs in advance and inform the customers that we are not painters and do not paint and caulk. We always tell the customer that they may need to caulk and paint afterward. Remove the trim from top and sides of one side of the door only. Dont forget to remove all the little nails you find, to avoid having difficulty taking the door out and difficulty reattaching the trim after completing your repair. We deliberately do not show the inside workings in this example repair because we dont want to give the whole farm away. The next images are the after images with the repair completed and the trim reattached. You can see, that using this method can save you a lot of money and heartache. We reattached the trim using our nail-gun and the end result is a repaired and suitably operating pocket door. Here you can see the reattached trim and the slight damage to the paintwork, that the customer will fix themselves. And this is the look after cleanup from the vanity side of the bathroom. The entire project took about 3 hours to complete and did not involve any new parts, apart from some nail-gun nails. Sliding Doors Are One Of the Weakest Links In Your Home - What Can You Do? The above video is actually an explanation of how to replace a sliding door installation with french style doors but it does highlight the ease in pulling the common sliding door from it's tracks. I am called upon often to repair sliding doors, that have become increasingly harder to operate. There are multiple reasons that doors can become inoperative, but we will leave that for a later article. The reason I decided to include the above video here is to highlight the extreme weakness that almost all sliding patio doors suffer from. You can see how easy it is to lift the door from it's track. When the door is closed, it is usually held locked by just a metal hook. Often that hook is all that is preventing the door from being opened. I have seen many instances where the sliding door is the principle method of surreptitious entry. Often intruders simply use a large screwdriver or prybar/crowbar (found in most automobiles) and lever under the bottom of the door, raising the whole door frame enough to remove the door completely from the track. Even while still locked. There is a very simple and cost effective measure that can be applied to prevent most sliding doors from being removed in this fashion. Simply, install a self-tapping screw into the top track, so that the head is protruding enough to allow the door to still slide but reduce the lift, or amount the door can be raised. Some lock manufacturers include anti-lift pins in their locks to help with this problem, but often the parts are made from die-cast aluminum, which is weak and brittle. For about 50 cents you can prevent the door from being lifted off it's track. Many people insert a piece of dowel or length of wood into the track behind the door. While this is probably one of the cheapest and best methods for preventing the door from sliding open, it does nothing to stop the door from lifting up. In June 2010 we posted an article (below) about solar powered power options designed to be used to enable electronic security products. We have seen a great number of pageviews for this particular post and thought we'd follow up that article with an opinion about the multitude of electronic wireless, battery powered products that continue to enter this (getting) crowded market segment. In a number of other articles we have written here, we have continued to question the benefits and quality of many battery powered security products. We believe that the battery powered security devices, specifically deadbolts, entrance sets and the like can offer only 2 primary benefits that can make them appealing. 2. The ability to set automatic locking on the product, to ensure your product locks independent of human involvement. Understanding that many consumers today are increasingly interested in the many and varied battery powered options, aimed at simplifying their lives, unfortunately the convincing sales pitches will rarely tell you about the genre's shortcomings. Specifically, the need to be constantly replacing batteries to maintain continued operations and the other primary issue, being that as all doors and frames move with weathering, settling, ground movements etc. your beaut $200+ deadbolt or entrance set WILL become useless before long and suffer electronic operability issues. We believe that the best security offered by deadbolts and entrance sets, is still the mechanical options that can be physically operated by hand. When a condition occurs that inhibits your ease of use, mechanically you can still play with it to get it to operate. Electronically, this is not possible. Way back in 2007, we posted article here about the Master Pro Series Padlock. The post has generated a great many page views over the years. We still believe this product to be one of the best in it's class. The Master Pro Series 6621 padlock is one of the finest and most versatile padlocks available for todays market. It is an all-weather resistant padlock. The Master Pro Series Padlocks are among the finest padlock products in their genre. The source below display the many and varied options of this widely respected padlock range. A daring burglar in Indiana entered a homeowners residence though an unlocked door, ransacked the place and made his daring getaway on a for-hire scooter, according to an article appearing on ABC News. According to the article the resident was at home during the raid and even heard some noises downstairs but when he went to investigate, he saw his wallet, laptop and car keys were missing. According to police, there was no sign of forced entry indicating that the back door was left unlocked. The Bird Scooter rental company has distanced themselves from the incident. The article (in the source below) is yet another instance where crimes of opportunity appear to be on the rise. Leaving your doors unlocked used to be okay, in previous years but today, you're just asking for trouble. Locksmiths across the country and around the world can provide quality locking products that will automatically lock the door when closed, but even the ages old nighlatch is designed to lock every time (unless you snib it open). There is an apt saying, "Keep It Yours - Lock Your Doors"! In another article appearing on 10TV News in Hamilton Ohio, an elderly resident has been robbed by a man, whom she knew and even hired. Apparently she paid him $150 to cut down a tree (which he never completed) and then this man entered her unlocked home and stole a further $250+. This is yet another reason to "Keep It Yours - Lock Your Doors"! According to Electrek, users of the new model complained about the lack of a key fob option to which Tesla decided to produce a fob similar to the types used in the Model S and Model X.
Tesla, reknowned for pushing the envelope in modern engineering, decided early to adapt their offerings to eventually remove the mechanical keyswitch from their vehicles, saving costs and manufacturing conveniences. The source below offers some additional images of the fob. Note: Thos fob is only for the Tesla Model S.
Pictured above is a Google Maps embed of the location of the Denny Dennis Sporting Goods Store in Fenton, Missouri where thieves rammed the garage door to gain destructive entry and steal a number of firearms that are said to already have made their way to the streets of Missouri. An article distributed widely has informed us about the daring burglary of the gun store and the theft of a number of firearms. Another article in The St Louis Post Dispatch, dated September 6, 2018 also discusses this troubling trend of increasing burglaries of gun stores across America (see source below). The article goes on to quote the store owner and his company's attempts to better secure his establishment. He explains that their use of gun safes actually mitigated further troubling loss. Using security cameras, alarm systems, bollards at the front etc, they show that the store owners and management are pro-active in their security concerns, but it is still disappointing and troubling that there are still so many nefarious attempts to burglarize gun shops. A number of locksmiths across the world choose to offer automobile key manufacturing services. Not because we dont know how. We choose to offer our expertise in other ways. For many of our first 20 years in the locksmith profession, we offered automobile locksmith services too, But in the last 13 years, here in our geographic region we found that too many local operators are simply not charging enough for expert automobile locksmithing services. Lucky for us, we enjoy professional relationships with a number of colleagues whom we believe to experts in the field and have no hesitation in recommending their automobile locksmith offerings. Many locksmiths across the world are often called upon by customers to duplicate or re-create original keys for cars, trucks, buses, motor homes, prime movers, motorcycles and other motor driven equipment. Since 1995, many automobile manufacturers have included advanced security features to their products, in an attempt to provide their customers with state of the art protection, reduce incidence of theft and also to provide advanced diagnostics information for mechanics and repairers. When the auto industry started evolving, many customers found themselves only able to duplicate modern auto keys at their respective dealerships. Not Anymore! Thanks to the excellent research and development of companies like Advanced Diagnostics, locksmiths across the world have been able to purchase suitable equipment to enable the duplication and origination of automobile keys. There have also been many advances in the locksmith industry in relation to the ability to make keys for cars without the need to remove lock cylinders. Tools like EEZ Readers, Determinators etc, reduce the need to dismantle doors or ignitions, significantly speeding up the time required to perform key origination requests. Many locksmiths posess the ability to code cut keys to customers providing the original keycode for their vehicles. But, the greater majority of customers never recorded the original keycode information after initial purchase, causing increased expense when the need arose to make new keys. In recent times, many automobile manufacturers have started to produce their vehicles without keycodes embossed on the lock cylinders and dealers usually only maintained records for up to 5 years. A new law is about to come into effect in California next year thanks to the efforts of the National Automotive Services Task Force (NASTF), that will require all dealer representatives to provide 24 hour keycode assistance to customers. The sticking point in this new legislation is that only approved locksmiths (ALOA members) and other specific trades, will be allowed to access this information. No doubt, the ability to access vehicle codes will impact the industry with likely increased prices for the purchase of code information, there are a few locksmiths who will never require the codes because, the level of training they have completed will enable them to provide services to customers in spite of the attempted industry regulating efforts of NASTF. When customers seek new keys for their vehicles, I recommend they seek out a qualified locksmith professional with the appropriate transponder programming equipment, who can offer services only a properly trained technician can perform. At Locks210.com, we consider ourselves reasonably proficient in many locksmith duties and tasks, however we are not currently suitably qualified or equipped to provide the expert assistance necessary to perform automotive key manufacturing requests. We strongly recommend the services of our colleague Patrick Chapman of St Louis Lock And Key (314)494-2510. If you are located in Vancouver, British Columbia or the surrounding area, we have absolutely no hesitation in recommending Mike Behr of Behr Lock Inc (604)880-9891. If you are located in the Winnipeg, Manitoba region, we strongly recommend Darren Ingleson of Wildwood Lock & Security (204)791-7911. Back in 2008, we first posted about the fabulous Strikemaster II product. A product designed, manufactured and marketed by a colleague from North Carolina. We have been continually selling and recommending this product for many years now, because it is one of the few products of it's kind that very inexpensively will repair your door after a door kick in without requiring you to replace the entire door and frame. Below, find one of our first posts about this product and the original video that was made to explain it's features. Over they last 10 years, we have installed hundreds of these products to customers who have suffered the heartbreak of door frame failure. I guess our clients love the fact that such a competitive priced American made product is widely available to correctly and professionally repair their door frames, without requiring they to spend significantly more for a new door and frame, that essentially will not protect them from similar attacks in future. A list of our articles about this product and similar offerings can be viewed here. The post below was first published here November 25, 2008 and has racked up a great many views during that time. Explaining the attributes of safes can be a chore to the uninitiated. The CDOJ (California Department Of Justice) put together their own list of attributes to consider when purchasing a safe. Pictured above is just a random image selected online of a safe. Choosing a safe is often difficult. I have been asked many times over the years to make a recommendation to customers wishing to purchase a safe. A little over 11 years ago we posted the following article here in our blog. Since then, a great many products have come and gone from the marketplace, claiming to be bump proof, bump resistant, pick proof, pick resistant etc. Unfortunately, ensuing years have proven many of these claims to be untrue, except for the leading Australian designed Bilock Extreme Security, bump proof and virtually pick proof high security key and lock system, among few others including Abloy and in later years Multilock MT5. The advent of many electronic lock products has not prevented many of them being vulnerable to bumping or picking and many customers still appear to be accepting the advice of untrained and unknowing sales assistants at leading big box hardware stores over the tried and true experience of the second oldest profession on Earth - Locksmiths. Latest Bumping Video from Master. Bilock is the only fully 100% guaranteed bump proof pin tumbler lock cylinder available. Bilock has been available since 1980's with technology that is many years ahead of others. Locks210.com is a proud Bilock Extreme Security exclusive dealer. Multiculturalism has become a very large and important part of society and business life today, with a great many people living here and across the world who may speak little to none of the native language of the land. I was called to a client last Friday, to survey and estimate for a door and lock repair project, where the customer who had filled out the online lead form, obviously didnt understand much English. I contacted them immediately (as i try to do with all leads) and noticed the difficulty in understanding them and they in understanding me. By speaking very slowly and enunciating my words, I was able to get my message across and determine some of their needs. I arranged a suitable time (in the following hour) to attend and provide a free onsite survey and estimate, like we offer to all our clients. Upon arrival, ringing the door bell and waiting, the clients daughter answered the door and invited me in. She spoke very little English and after a few minutes I managed to get her to tell me that she was Nepalese. She pointed me in the direction of the project request and toward her father and mother. The difficulty in communicating, to determine their needs was perplexing until I remembered that Google produced a fabulous app, a few years ago called Google Translate. Having traveled abroad, a number of times in recent years and me not speaking the native language of some of my destinations, I have successfully used the Google Translate app on my cellphone a great number of times. From reading menus to understanding street signs, the Google Translate app has quickly become one of my most prized app's. I remember traveling from Italy, through Switzerland to France, a few years ago and we stopped over in Bern, Switzerland for a few hours while waiting to transfer trains. We decided to look for a bite to eat but very few of the signs had English translations, so understanding where to go and what to do was difficult without the app. The app includes a microphone feature that enables you to speak in your language and it will automagically translate into the desired language for which you want to speak. Then you can play the translated phrases for your subject to hear and understand. they can then respond in their language, again into your cellphone and the app will translate into English. then I press the play button and a Google created synthetic voice will speak in English. While abroad another time, we were staying in Madrid, Spain for a few days and wanted to go to the oldest restaurant in the civilized world, Sobrino de Botín and eat from their unique menu. The taxi driver that picked us up at the hotel, did not speak any English at all and I immediately pulled out my phone and spoke our request into the Google Translate app. When the driver heard the synthesized voice, he lit up and smiled and understood perfectly. he responded in Spanish and thanked us for introducing him to such a fabulous tool that would help him to earn substantially more money in future. ......back to the subject of the post here... the customer was able to communicate their needs in their native Nepalese and to understand my responses after translating from English. We have arranged the project completion for next week and chalk up another satisfied client. If you run your own show, or even if you dont, you will most likely run into communication issues in your life and sometimes your daily travels. 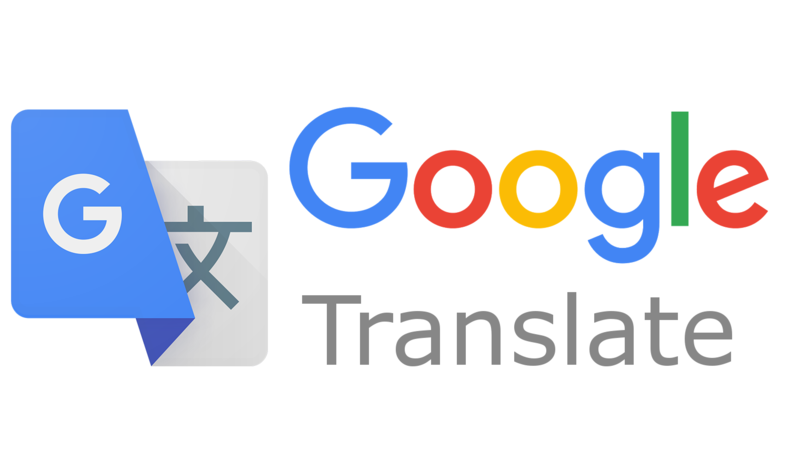 using the Google Translate app will help you to communicate easily with almost anyone and provide top notch customer service for which you will be remembered and referred because of. I highly suggest you download the app from your OS app store and start capitalizing on income opportunities from customers, whom in the past, you may have had difficulties talking to and with. Below find links to the app in Apple App Store and Google Play.